Welcome to the Bark Busters Home Dog Training serving Aquebogue, Babylon, Bay Shore, Bayport, Bellport, Blue Point, Bohemia, Bridgehampton, Brightwaters, Brookhaven, Calverton, Center Moriches, Centereach, Commack, Coram, Cutchogue, Deer Park, East Hampton, East Islip, East Marion, East Moriches, East Northport, East Setauket, East Quogue, Eastport, Farmingville, Great River, Greenport, Hampton Bays, Hauppauge, Holbrook, Holtsville, Huntington, Islandia, Islip, Islip Terrace, Kings Park, Lake Grove, Laurel, Manorville, Mastic, Mastic Beach, Mattituck, Medford, Melville, Middle Island, Miller Place, Montauk, Moriches, Mount Sinai, Nesconset, Northport, Oakdale, Orient Point, Patchogue, Peconic, Port Jefferson, Port Jefferson Station, Remsenburg, Ridge, Riverhead, Rocky Point, Ronkonkoma, Saint James, Sag Harbor, Sagaponack, Sayville, Selden, Shirley, Shoreham, Smithtown, Sound Beach, South Hampton, Southold, Speonk, Stony Brook, Wading River, Watermill, West Babylon, West Islip, West Sayville, Westhampton, Westhampton Beach, Yaphank, and all of Suffolk County, New York. 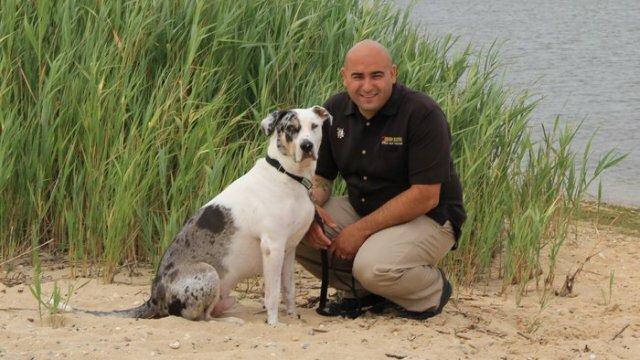 I'm Jason Molfetto, Behavior Therapist and Master Trainer, 2016 Bark Busters North America Founders Award recipient. Bark Busters is the #1 World’s Largest Dog Training company with over 26 years’ experience and well over 1 million dogs trained! A bark buster since 2005, I have trained thousands of dogs and families in their homes. I have also assisted in teaching dog safety techniques at National Grid and conducted group puppy training sessions. We Long Islanders love our dogs! Our dogs are members of our families. We spend thousands of dollars each year to keep them healthy, pampered, happy and entertained with vet visits, dog toys, dog treats, doggie outfits and more. We give our dogs everything we can, and in return they give us unconditional love and acceptance. Whether you have a rescue dog (like I do), a new puppy, or an oldtimer, I can help you find that place of peace and understanding in your home that you are longing for. I have worked with dogs of all ages, dog breeds ranging in size from Great Danes, to German shepherds to teacup terriers, dogs with disabilities (my own dog was born deaf). I have worked with an amazing diversity of clients (differently abled people, senior citizens and so many families each with unique needs), and I’ve found success again and again using Bark Busters proven techniques. Most clients see immediate results in our first session! This is because your dog is already programmed to understand other dogs. I teach you how to “speak dog” using voice tones and body language. I don’t use prong collars, electric shock, or any other aversive techniques. Our dog training focuses on using dogs' natural instincts to work toward a win-win situation for you and your dog. Trust, clear communication and understanding produces longer lasting results than treat training or force. I give you the tools to train your dog. Friends will be calling YOU the Dog Whisperer! And I promise, if you follow these proven techniques, you will be amazed and satisfied with the results you see, and most importantly you will create a stress free home environment for your dog and your family. ANY ISSUE, ANY AGE ANY BREED! Take the Bark Busters Dog Behavior Quiz to see how your dog(s) score! Let me design a unique training plan for you, your dog and your family! Call my office at (631) 683-8385 to make an appointment today! Our relative's dog, Emily exhibited random aggression. Jason completely transformed Emily's behavior. She is so loving and gentle, now. Emily's response is instant and she listens to all commands. She is such pleasure to spend time with whenever we visit our relatives (her owners). Our family has it's dog back. Thank you, Jason!!! Fantastic. Jason is very professional. One day later Prince's behavior has improved. Prince likes Jason but respects him. Can't say enough good things about Jason.